From the moment you say “hull-o”, you will be treated like one of the family – on a farm that means doing the daily chores. Itinerary and farm maps are provided on your arrival to outline the scheduled meal and chore times! 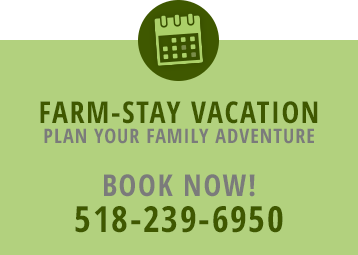 Besides the chores, there will be plenty of down-time for romping with the rabbits, cuddling kittens, fishing in the farm pond, hayrides through the fields, exploring the countryside and bonfires with s’mores. At the end of summer, a corn maze is open where you can go ‘get lost’ for a while. In the fall, after finding your way out of the corn maze you can visit our pumpkin patch to choose that special pumpkin to bring home. New York’s #1 Family Water Park offers safe water fun, excitement and relaxation for all ages in a beautiful natural setting…and it is right down the road! Discount coupons available. Available July 1 – Labor Day. Enjoy horseback riding with the family in the beautiful Northern Catskills! We offer horseback riding lessons and horse training to all. Enjoy horseback riding with the family in the beautiful Northern Catskills! Imagine …stepping into an elevator that takes you 156 feet below the Earth’s surface. When the elevator stops, the doors open into a prehistoric underground cavern six million years in the making! Only 45 minutes away… Discount coupons available.